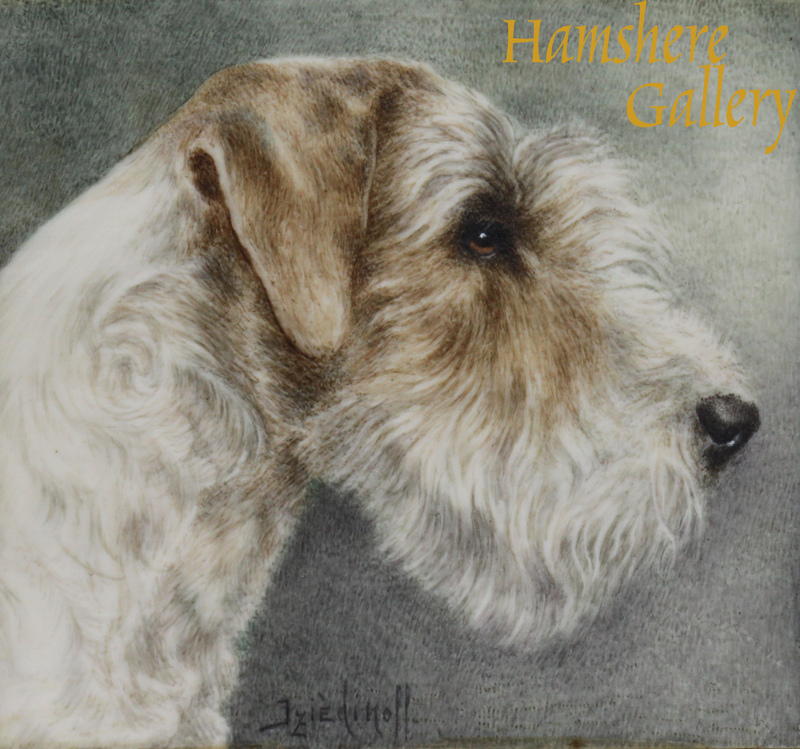 A watercolour on ivory of a head and shoulders study of an Airedale. Signed and dated bottom right “Iziedinoff 34”. Russian 1934. 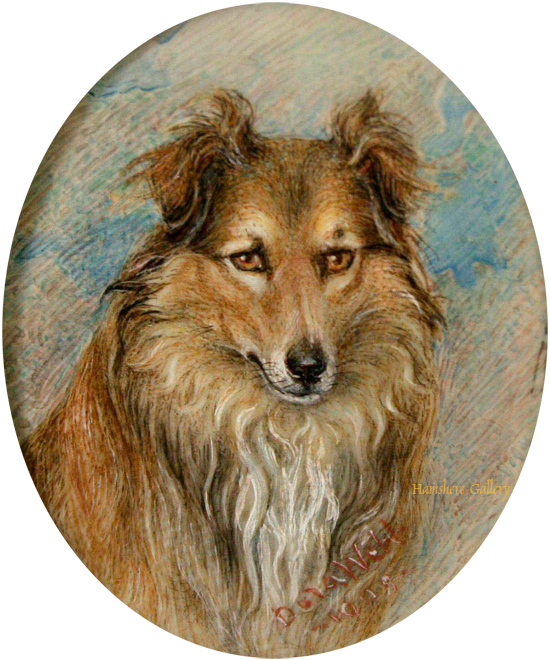 Miniature painting of the Border Collie "Wallace" by Dora Webb RMS (1888-1975) on ivory, signed and dated "D.Webb 1904". English, 1904. 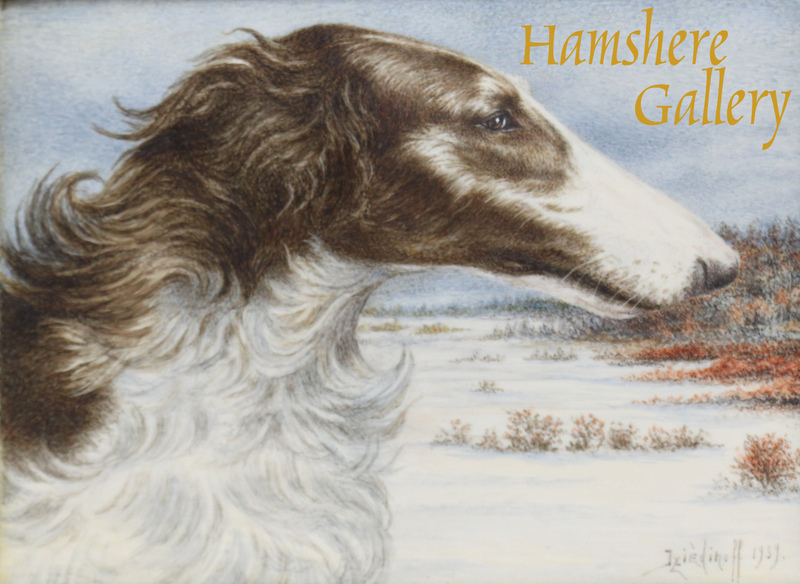 A watercolour on ivory of a head and shoulders study of Borzoi in landscape. 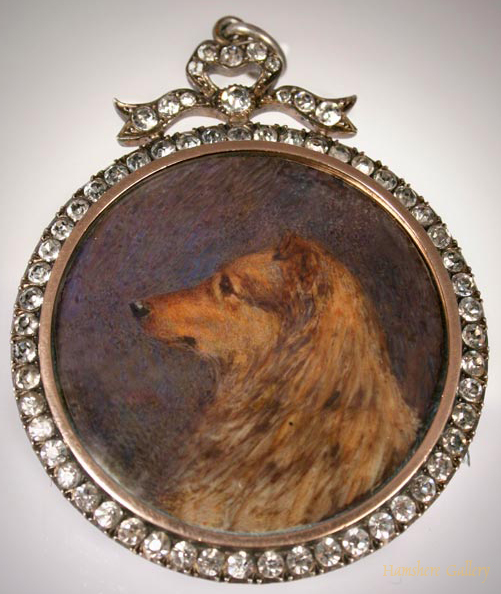 To the reverse inscribed in ink “A Borzoi Dog by George Iziedinoff A.R.M.S. 43 13ḏ Exelmans Paris 16 ème 11 Nevern Rd. London S.W.5.”, together with exhibition number “49”. Signed and dated bottom right “Iziedinoff 39”. Russian 1939. 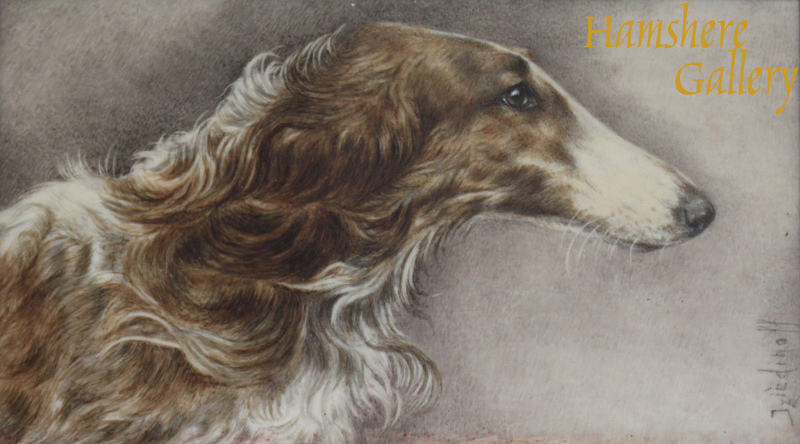 A watercolour on ivory of a head and shoulders study of Borzoi. Signed bottom right “Iziedinoff”. Russian 1938. 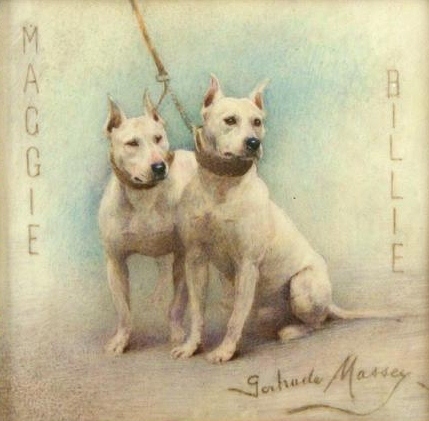 Miniature of two Bull Terriers called "Maggie" and "Billie" by Gertrude Massey (1868-1957) signed "Gertrude Massey". English, circa 1905. Set within original gilt-metal frame with pierced ribbon crest. "Two Bull Terriers" was exhibited at the New Gallery when the artist was living at "11 Melina Place" St. John's Wood, London. 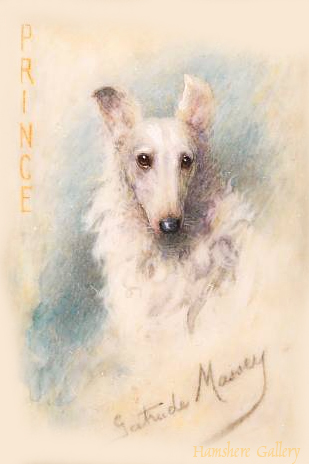 And in 1900 at "The Fine Art Society's", New Bond Street, London "Exhibition of Miniatures of Dogs by Mrs. Gertrude Massey". 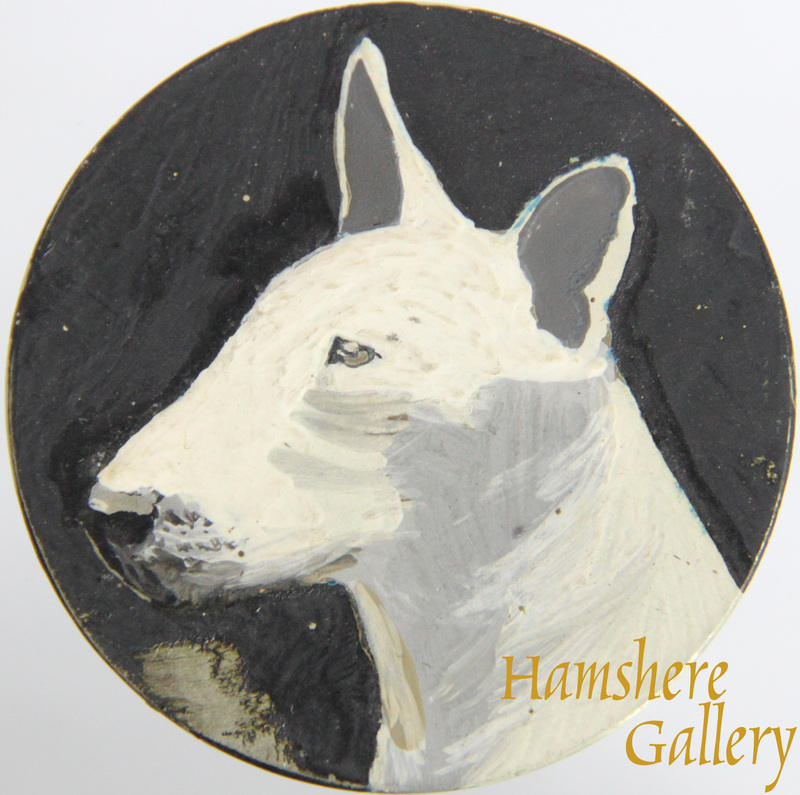 A tondo miniature in oil, on metal, of head and shoulder study of an English Bull Terrier by Mrs Ellen Sylvia Shaw (English, 1868-1947), set as a brooch. Unsigned. English, circa 1930. 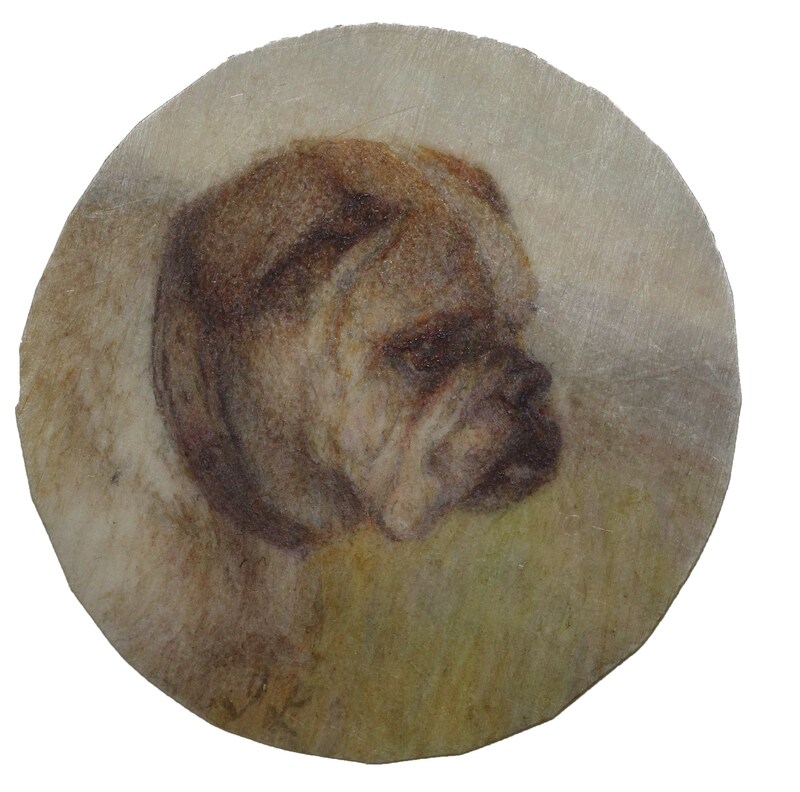 An ivory rondo watercolour miniature of a head study of a tan Bulldog by Mrs Dorothy Oliver (Exh. 1905-14). Signed bottom left “D. Oliver”. 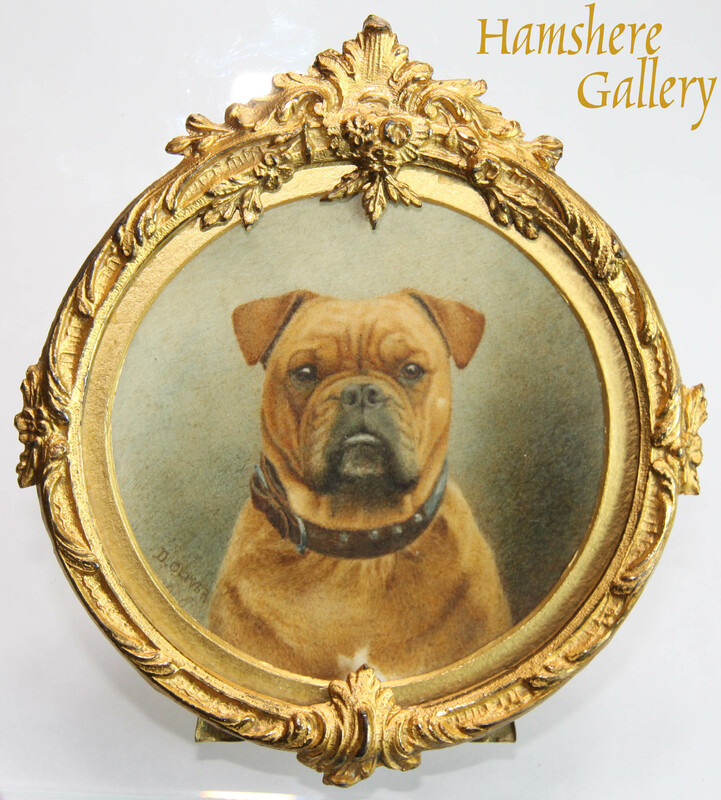 Set in ornate ormolu easel / pendant frame. Circa 1910. 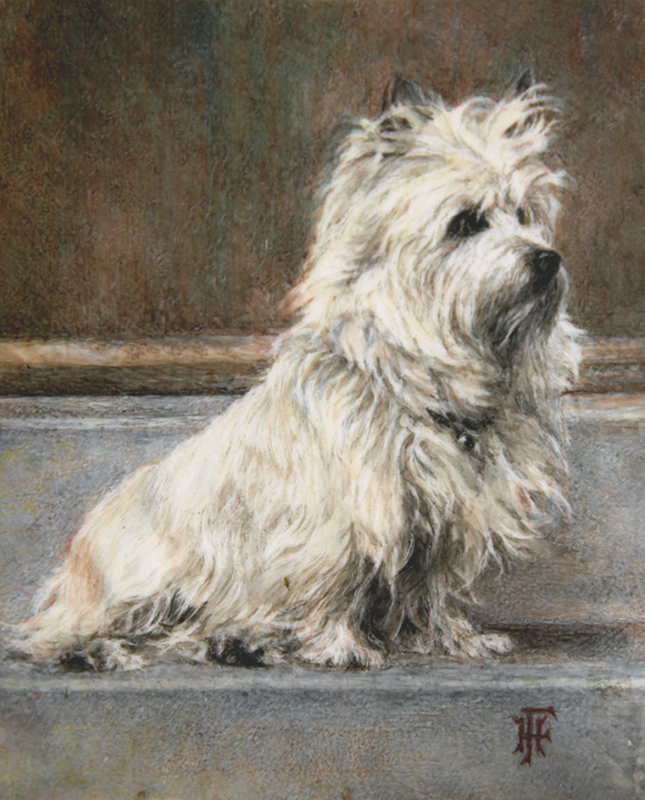 A miniature on ivory of �Jane� a Cairn Terrier seated in an interior exhibited at the Royal Miniature Society in 1963 by Hilda Farmery (English). Monogrammed bottom right �HF�. 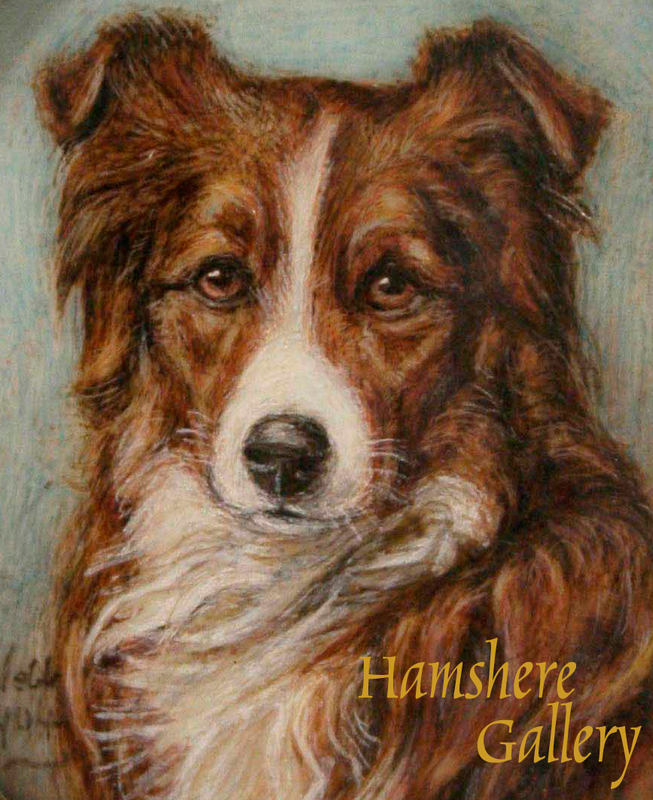 The reverse bears the inscription in ink� JANE Mrs G Whiteman�s cairn terrier PAINTED BY Hilda Farmery Exhibited at R.S.M. P 1963 SILVERSTREAMS WEIR ESTATE SUNBURY UPON THAMES�. Circa 1963. 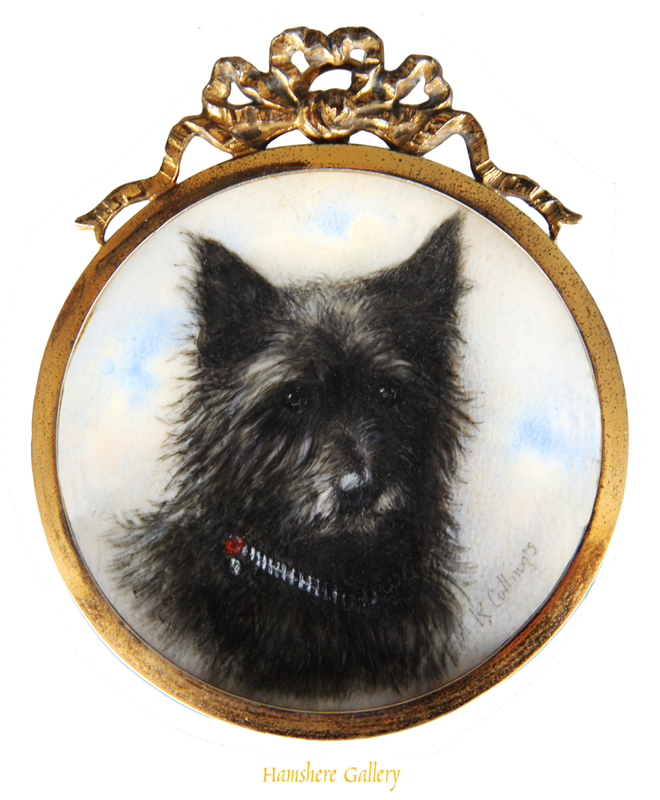 An ivory rondo miniature of a head study of a Cairn Terrier by Keturah Ann Collings, (English, 1862 � 1948). Set in Goldsmith�s and Silversmiths in a silver gilt frame, and assayed London 1907, and complete with its original box. Signed bottom right �K Collings�. English, 1907. Collings (Keturah Anne Beedle) was a portrait artist and miniaturist. On marrying her husband Arthur Albert Collings, she assisted him in his photographic portrait studios in Brighton and Hove in the late 1880s and early 1890s. Around 1905 she opened a studio in 16 North Audley Street, London. The studio was favoured by a number of European Royal Families. The studio was closed around 1913. 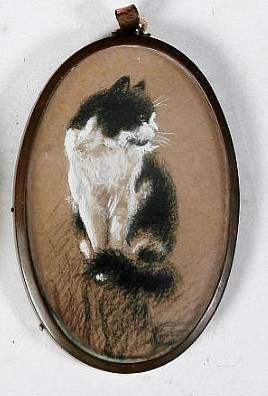 Cat miniature on ivory by Felicity Cambell. To the reverse "No. 2. Peter James by Felicity Campbell Friars Hill Cottage Guestling Sussex." Exhibited at Royal Academy. 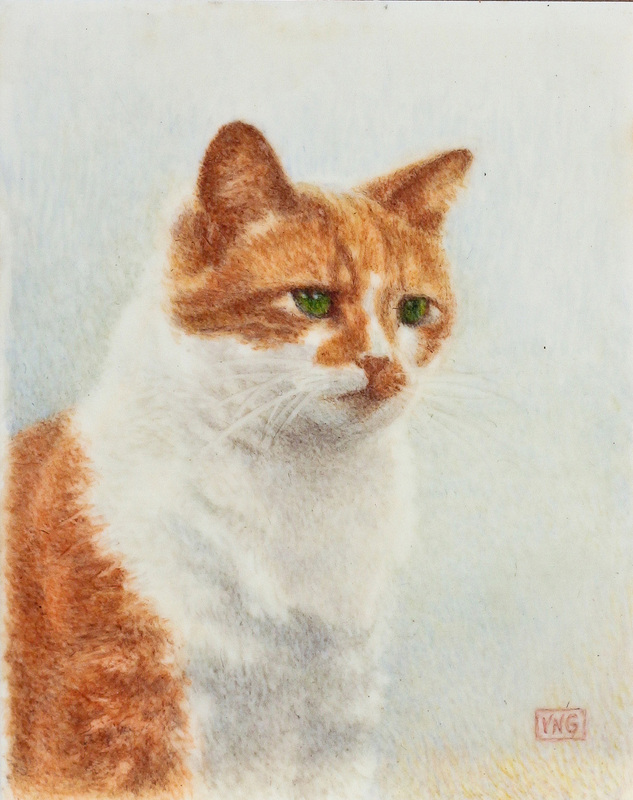 A miniature on ivorine of a head and shoulders study of a ginger and white cat by Violet Nellie Garrod (English, 1898 - 1981). 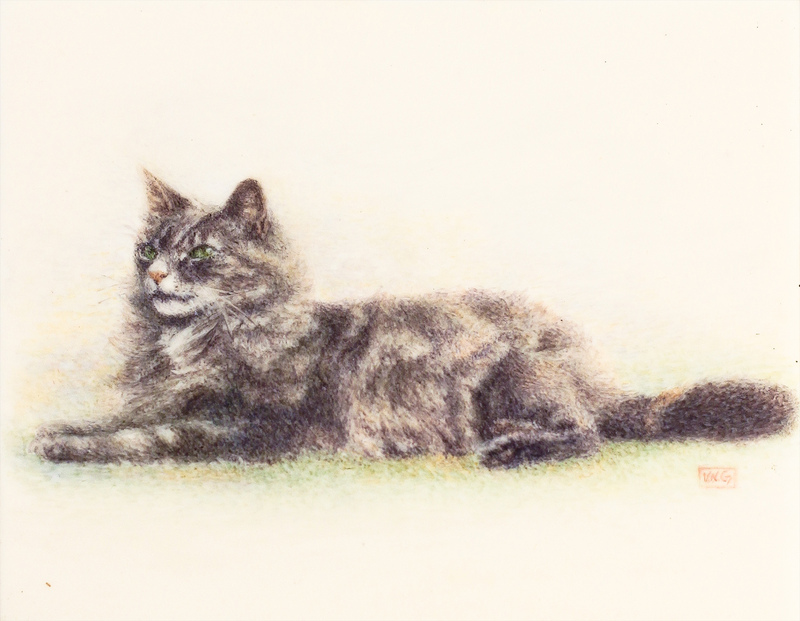 The cat is believed to be one of the artist's cats. Monogrammed bottom right in a rectangular cartouche 'VNG '. 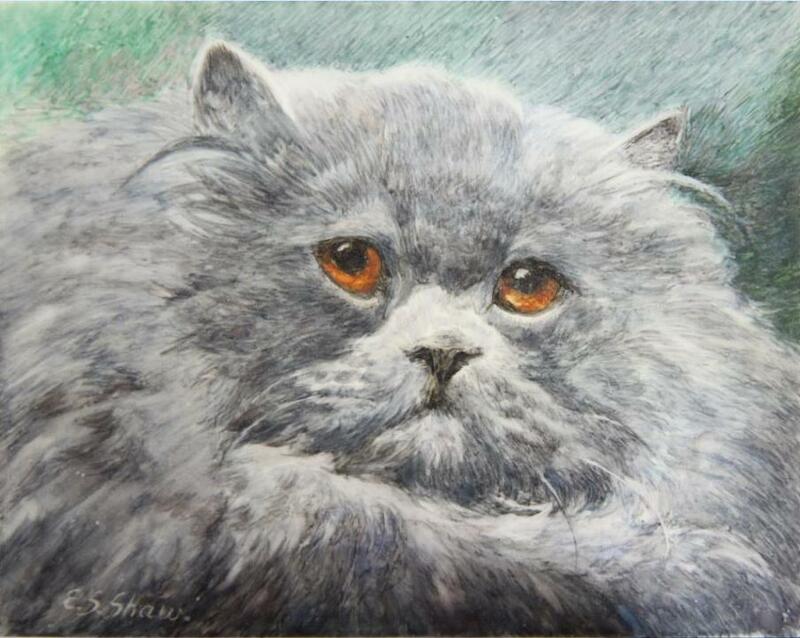 A miniature in watercolour on ivory of head study of Champion Raleigh a famous Blue Persian cat by Mrs Ellen Sylvia Shaw (English, 1868-1947). Signed bottom left “E S Shaw”. The reverse bears number “5” label “Mrs Ellen S Shaw, 6 Colney Hatch Lane, Muswell Hill, London, N.10”, with “Title:- The Late Ch Raleigh” and “Price:- £9:9:0”. In hammered silvered frame. Most likely the artist’s exhibition piece. English, circa 1937. 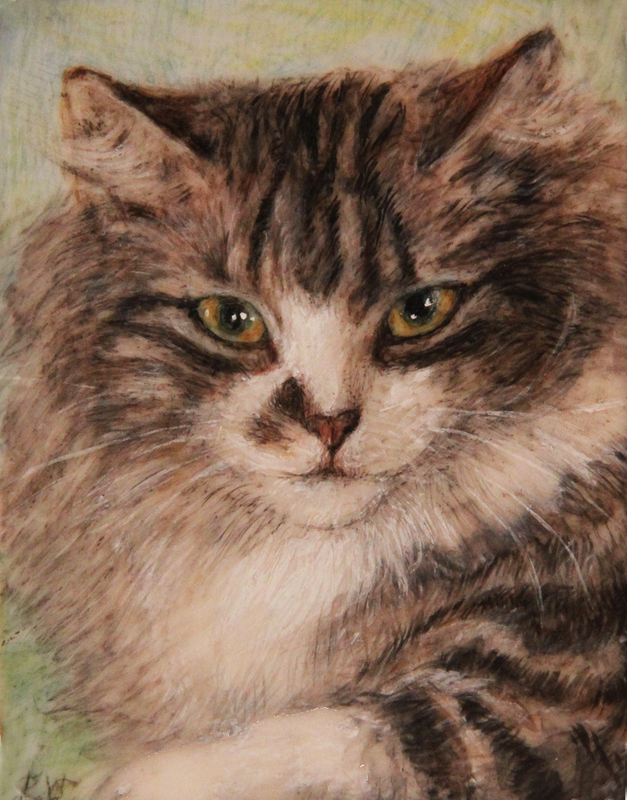 An ivory rondo watercolour miniature of a head study of a Persian cat by Mrs Dorothy Oliver (Exh. 1905-14). Monogrammed bottom right “DO”. Set in gilt pendant frame. 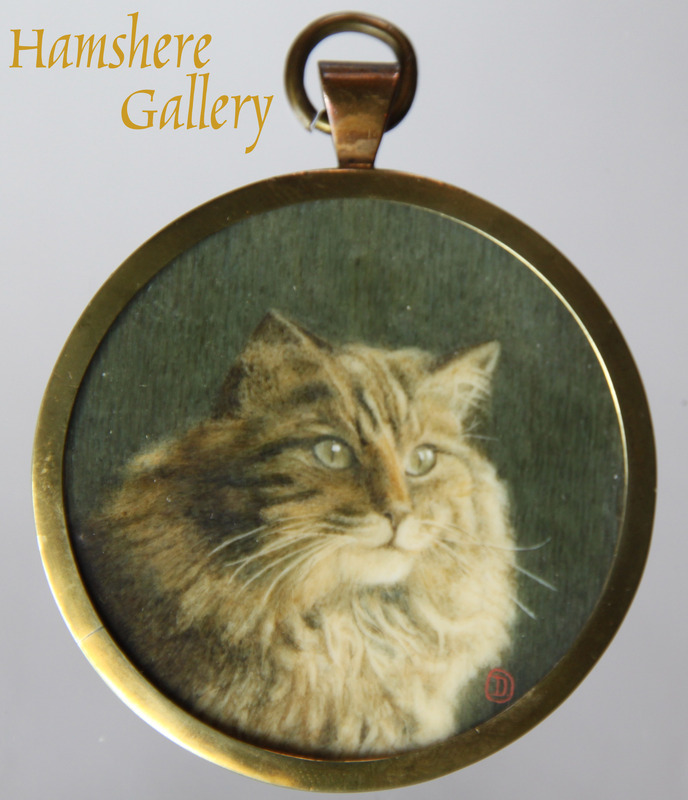 This is believed to be the artist’s 1906 exhibit, “Cat 67 Fluff – Persian Cat – Ploopy” at The Royal Scottish Academy and then exhibited at The Royal Glasgow Institute of the Fine Arts in 1907. Circa 1906. 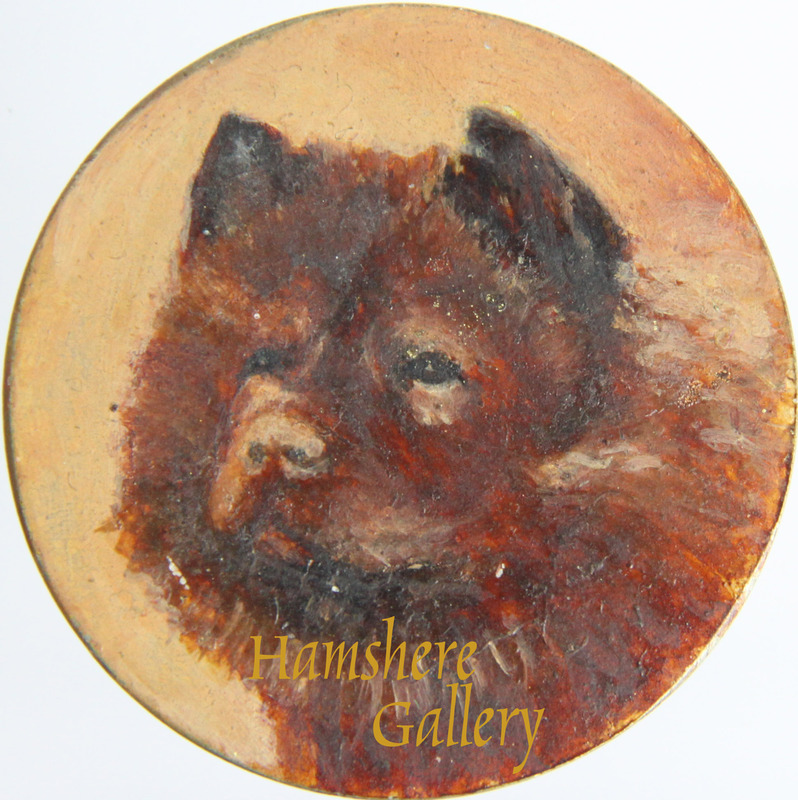 Miniature water colour on paper of a Chihuahua by Miss Emily F. Heath. Note the expensive colour the dog wears. English circa 1895. 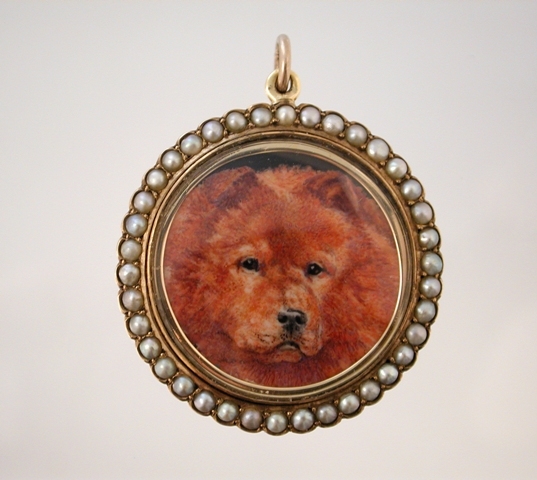 A tondo miniature in oil, on metal, of head and shoulder study of a Chow Chow by Mrs Ellen Sylvia Shaw (English, 1868-1947), set as a brooch. Unsigned. English, circa 1930. 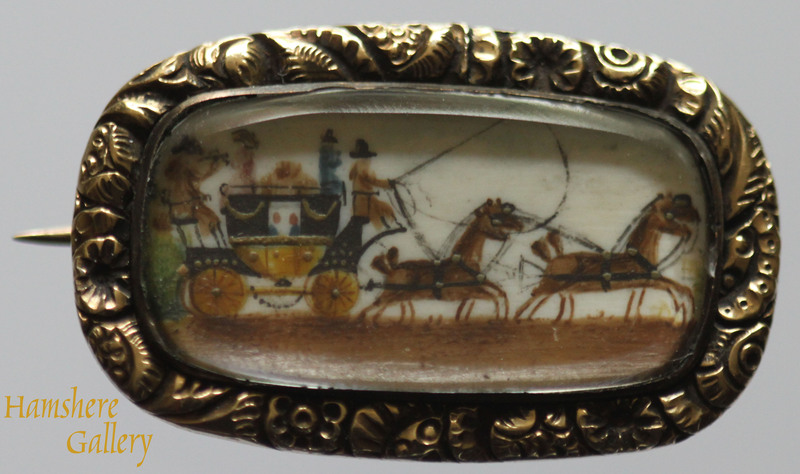 22 ) Early 19th coaching / carriage / four-in-hand miniature scene set as a gold brooch. 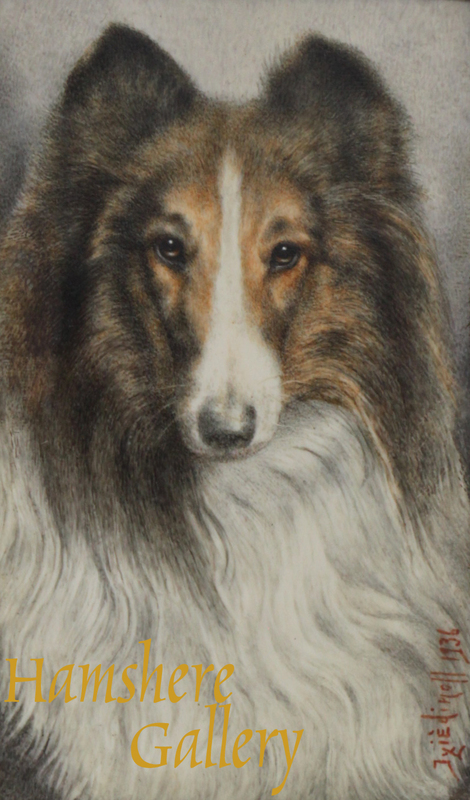 A watercolour on ivory of a head and shoulders study of a Collie. Signed and dated bottom right “Iziedinoff 36”. To the reverse “liste III N10”. Russian 1936.